Number Four in the series of Christmas cards printed by the Favil Press for the Poetry bookshop, containing the poem 'The Curate's Christmas Eve' by Monro, and two coloured engravings by Stewart, one entitled 'Decorations'. Printed on one side of a piece of paper roughly 46 x 32 cm, folded twice to make a 23 x 16 cm card. Good, on lightly aged and spotted paper. 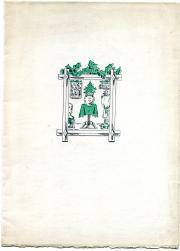 On the front is a small illustration in green and black, roughly 7.5 x 6 cm, showing a picture of a domestic Christmas interior in an ivy-topped frame. 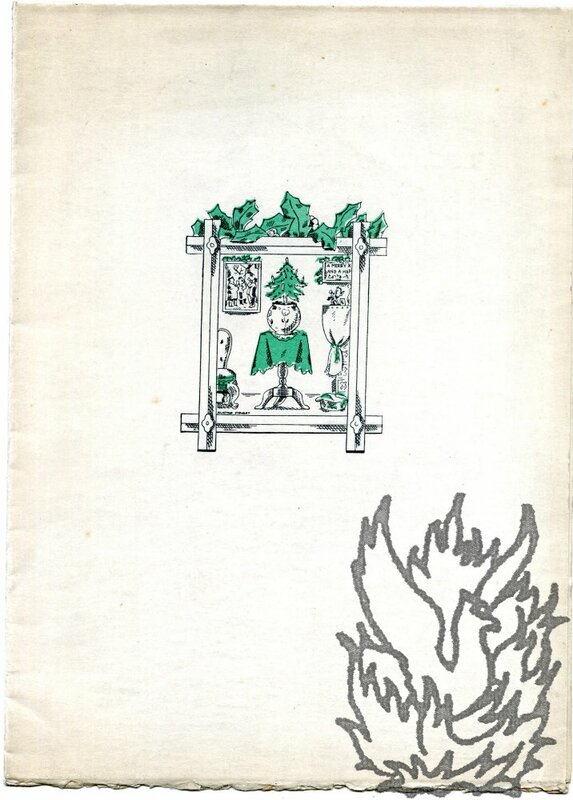 Inside the card, on the left-hand page, is Monro's poem, of 18 lines arranged in three stanzas, beginning, 'The Curate and the Spinster sit. 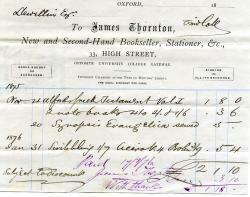 Marked as paid on 17 March 1876. 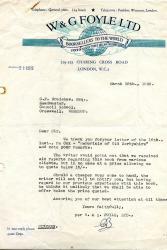 On the firm's printed letterhead. Printed on one side of a piece of paper 13.5 x 16.5 cm. In good condition. 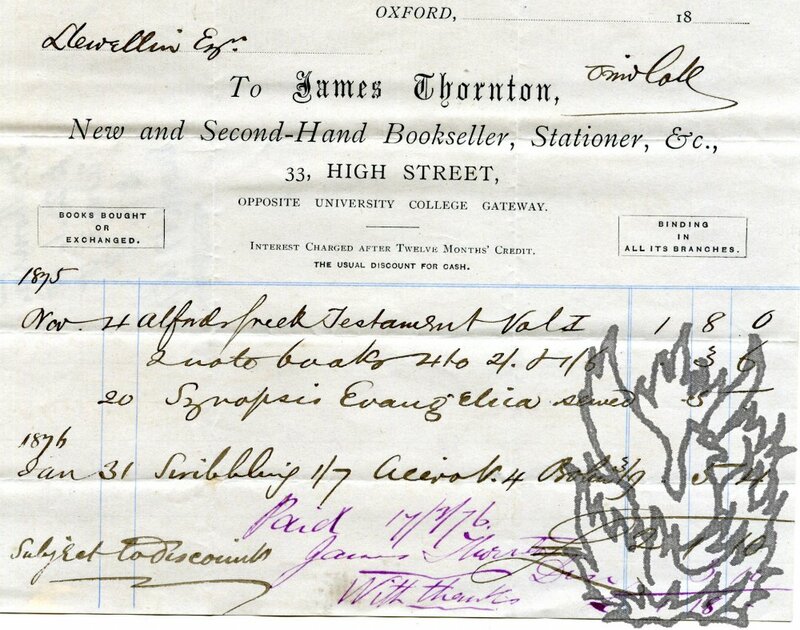 Ruled in light blue, with letterhead in black: 'To James Thornton, New and Second-Hand Bookseller, Stationer, &c., 33, High Street, opposite University College Gateway. | Books bought or exchanged. | Binding in all its branches. | Interest Charged after Twelve Months' Credit. | The usual discount for cash.' Lists purchases made on four dates between November 1875 and January 1876, totalling £2 1s 10d, and marked as 'Subject to discount'. 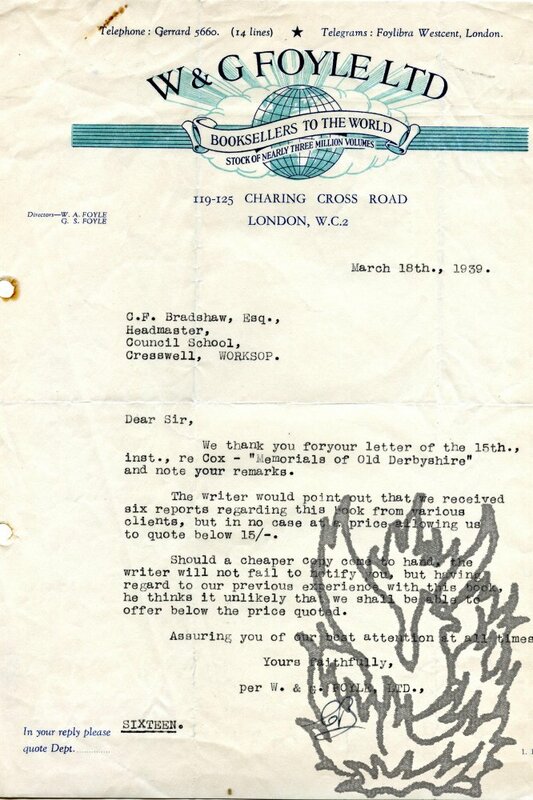 Beneath this, in purple ink is written 'Paid 17/3/76.